Find out what Bull's-Eye has been up to with it's Winter Newsletter. Lot's of completed projects, industry articles and news! New client Crossroads Community Ministries engaged Bull’s-Eye to assist with the design and development of an updated services brochure. 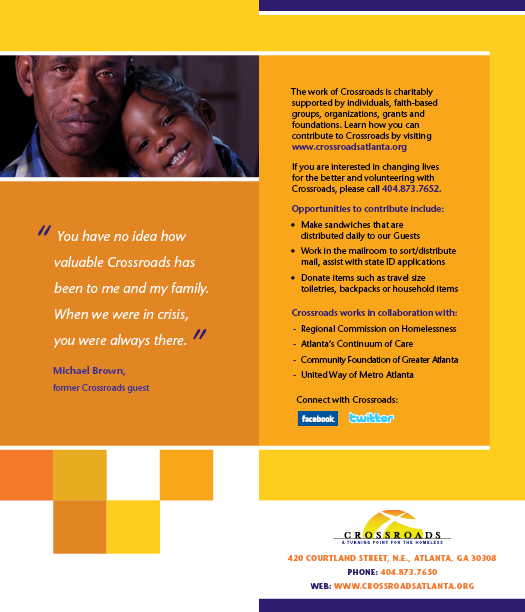 Crossroads is a nonprofit that assists and aids Atlanta's homeless men, women and children in getting back to work and transitioning their lives. The client was looking to directly reach volunteers and benefactors and inform them of the many valuable services they offer to the community. Crossroads offers meals, mail box, housing referral, disability assistance and identification support. The solution that Bull’s-Eye designed is a clean, bright and modern design. The new brochure has detailed information on the services offered and reinforces the value in assisting this segment of our community. Bull's-Eye completed the design and development of a series of educational posters for Global Health Action. The nonprofit organization works to improve the health and well-being of individuals and communities in under-served parts of the world through community-based health programs. 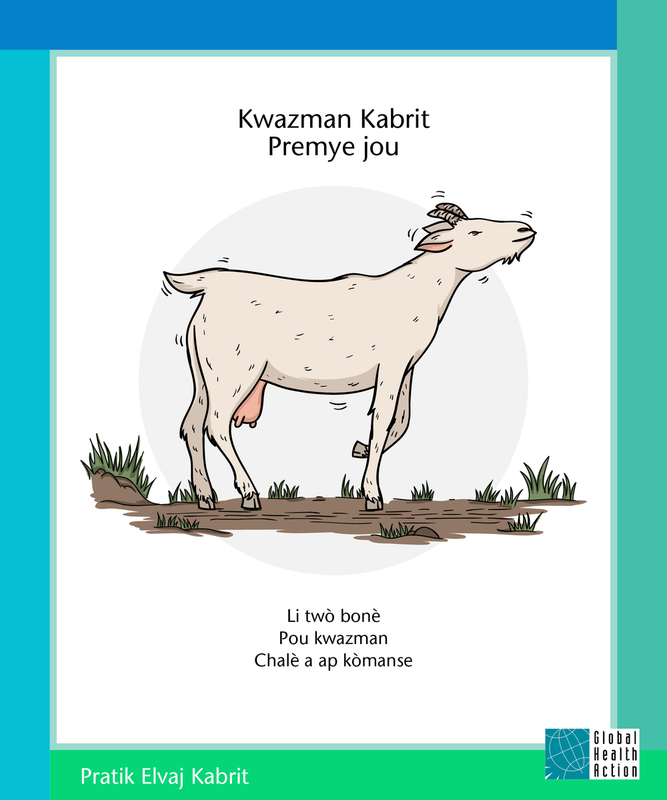 The posters are visual learning aids for a program in goat husbandry in Haiti. 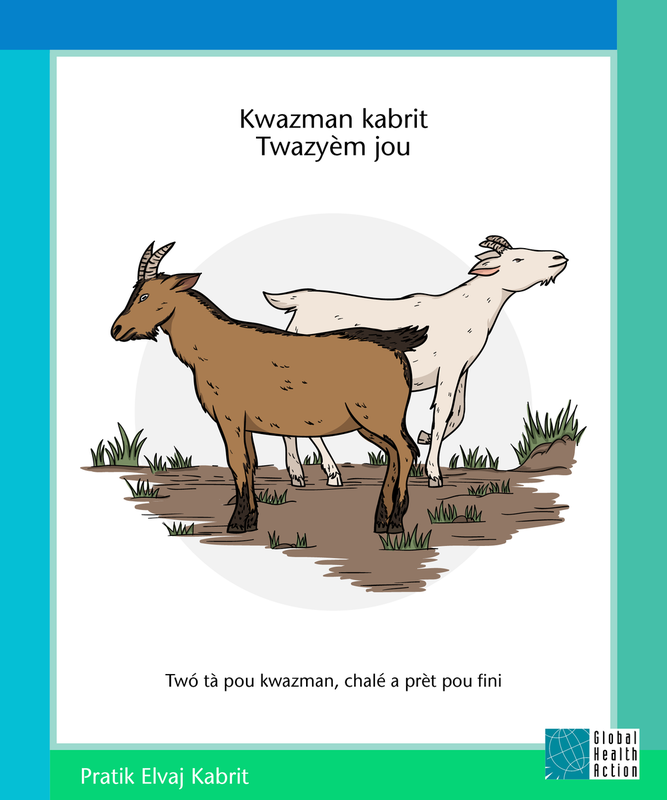 The program helps improve household incomes by providing knowledge and building skills in goat care and breeding. This extra income enables farmers to purchase food to feed their families, buy medicines, send their children to school and repair their homes. The client was thrilled with the results and stated: "Everything looks great! We’re starting to get really excited about the idea of our staff in Haiti using the posters for the first time to teach a class!" 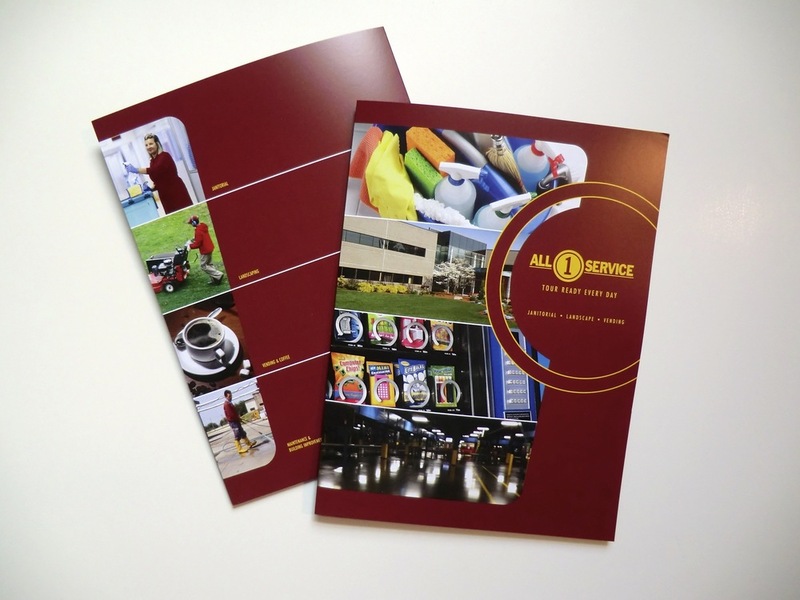 Bull's-Eye designed and produced a new pocket-folder to go with its new brochure for All 1 Service. The company is a Southeast regional service provider of commercial building services; janitorial, landscaping, vending and maintenance. All 1 Service wanted to create a pocket-folder to enclose company collateral as a leave-behind for prospect meetings. It is also used at trade shows and direct mailings for service inquires. Find out what Bull's-Eye has been up to with it's Fall Newsletter. Lot's of completed projects, new clients and news! New client The Madison-Henry Group, engaged Bull’s-Eye to assist with the design and development of their first direct-mail campaign. 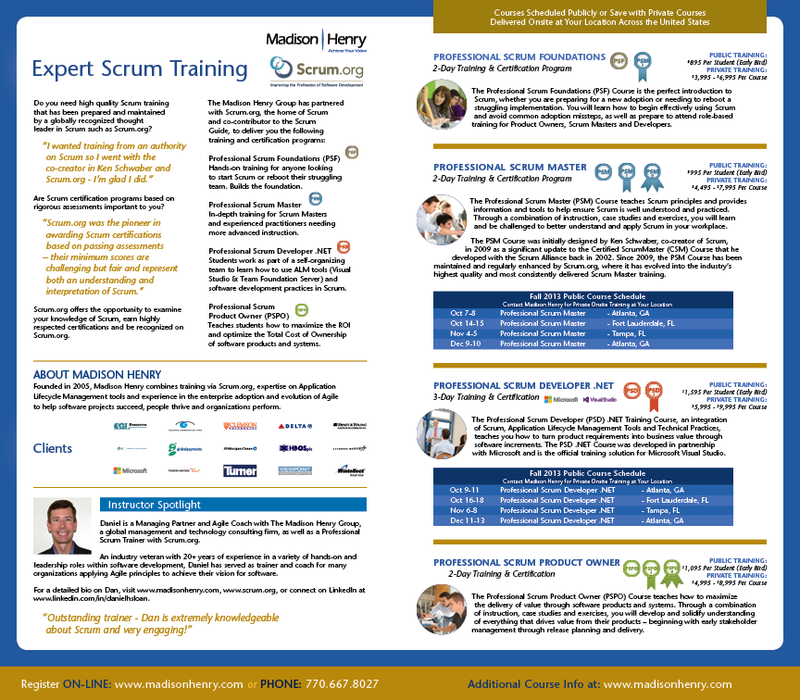 Madison Henry is a global management and technology consulting firm that helps organizations apply Agile methods and practices and offers Scrum training and certification. The client was looking to directly reach prospects and decision makers to market their Scrum public and private training sessions. These training sessions that are taking place through the South-East, are for design and developers, management and executives in the software industry. Bull's-Eye Creative Communication in Oz Magazine! Check out Patrick Carlson, Principal Partner of Bull's-Eye Creative Communication's "How I Got Into the Business" profile in Oz Magazines Aug/Sept 2013 issue! At IMPress Printing Show with long time friend Rebecca Pilgrim of Mohawk Paper. Bull's-Eye just completed an info-graphic for ControlScan: Get Them In the Game! E-commerce & Mobile: Are Your Small Merchants Benched? Info-graphic illustrates that many small merchants remain unaware of the mobile traffic to their website and its potential impact to their business. GRRRREAT Feedback from a client on a recent project!!! "I have really enjoyed working with you and appreciate the quality of your work. I really feel that this investment will pay huge dividends in the future for our practice, and your professionalism was unmatched. Everything really turned out better than expected."